Observation - Anemone - UK and Ireland. 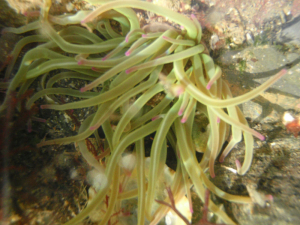 Description: Snakelocks anemone in a rock pool at very low tide. Pale green fairly long (about 4 - 5cm)thin tentacles with tiny mauve tips. Snakelocks anemone in a rock pool at very low tide. Pale green fairly long (about 4 - 5cm)thin tentacles with tiny mauve tips.